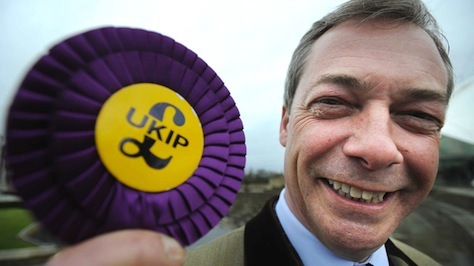 Though it’s been around for over 20 years, UKIP only started to register in polls in the United Kingdom — for national as well as European elections — for the first time in the last couple of years as UK voters have increasingly seen the European Union as a burden. Though it’s on the relatively less xenophobic side of the spectrum of eurosceptic parties (if you can believe it), UKIP gained significant traction opposing EU immigration rules that opened the British labor market to citizens from two of the newest EU members, Romania and Bulgaria. In spite of accusations that its leader, Nigel Farage (pictured above), a former commodities trader, has deployed racist rhetoric by slandering Romanians and Bulgarians as more crime-prone, he’s one of the most successful politicians in the United Kingdom today. British prime minister David Cameron, who has led a coalition government between his Conservative Party and the Liberal Democrats since May 2010, can withstand either a UKIP victory on Sunday or a victory by the center-left Labour Party. His Tories are on the upswing in poll surveys as the May 2015 general elections approach, and he’s announced that he will hold an up-or-down referendum on the United Kingdom’s continued membership in the European Union in 2017 if he’s reelected. Given the first-past-the-post system in national elections, there’s little chance that a UKIP surge will make much difference. In any event, the LibDems, Cameron’s junior partners, and the most thoroughly pro-Europe party in Great Britain, seem headed to a fourth-place finish. Farage was widely seen to have won a series of debates this spring with LibDem leader and deputy prime minister Nick Clegg. Latest poll (YouGov/Sun Politics): UKIP 27%, Labour 26%, Conservatives 22%, Greens 9%, Liberal Democrats 9%. Since Marine Le Pen assumed leadership of the FN from her father, Jean-Marie Le Pen, she’s had one goal — to pull the FN further to the center, so that it becomes a credible option to France’s traditional center-right movement, the current iteration of which is the Chirac-era Union pour un mouvement populaire (UMP, Union for a popular movement). In the era of former French president Nicolas Sarkozy, the UMP moved so far right on crime, justice and immigration, that the distance between in and the FN significantly shortened. Le Pen (pictured above) was already on the rise in May 2012, when she won 17.9% of the vote in the first round of the presidential election. But in the post-Sarkozy era, things have never been better for the Front. The UMP will remain divided until and unless Sarkozy returns to lead party in advance of presidential elections in 2017. French president François Hollande’s popularity is hovering around 20%, and he has already reshuffled his cabinet, appointing his relatively conservative interior minister Manuel Valls as his second prime minister. The Front, meanwhile, is coming off a record-breaking series of local elections in late April, and it’s attracted the support of French voters disillusioned with both the UMP and Hollande’s governing Parti socialiste (PS, Socialist Party). Latest poll (BVA): FN 23%, UMP 21%, PS 17%, MoDem 9.5%, EELV (Greens) 9%, FdG (Left Front) 8%. Among the most well-known eurosceptic parties is the PVV, led by the platinum-maned Geert Wilders, one of the most vocal critics of the threat of Islam in Europe. 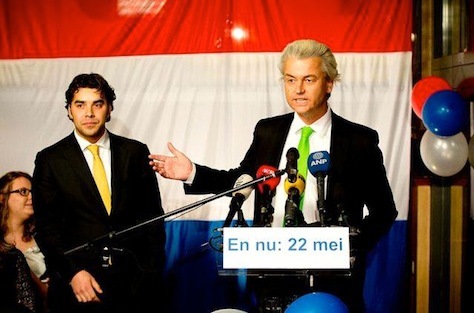 Increasingly, Wilders (pictured above) has turned his ire from Islam and immigration in The Netherlands to the eurozone, so much so that he called for Dutch withdrawal from the euro in the most recent national elections. Wilders left the center-right, liberal Volkspartij voor Vrijheid en Democratie (VVD, People’s Party for Freedom and Democracy) in 2004 over its support for Turkish accession to the European Union, and he’s been the enfant terrible of Dutch politics ever since. Most recently, he attracted negative publicity for remarks, following the April local elections, disparaging Moroccan immigrants to The Netherlands. The PVV is riding high due to discontent over the budget-cutting, tax-raising government of prime minister Mark Rutte, the VVD leader, and Diderik Samsom, the leader of the social democratic Partij van de Arbeid (PvdA, Labour Party). Though Samsom emerged as the anti-austerity star of the national elections in 2012 elections, his party’s embrace of Rutte-style austerity in coalition with the VVD has left many voters angry — and now looking to alternatives. Those alternatives include not only the PVV, but the center-left, liberal Democraten 66 (Democrats 66) and the far-left anti-euro Socialistische Partij (SP, the Socialist Party) — the latter is a great example of left-wing euroscepticism, given that it also rejects Dutch membership in the eurozone. Latest poll (Electionista poll average): Democrats 66 16%, PVV 16%, VVD 15.5%, Christian Democrats 12.5%, Socialists 12%, Labour 9%. Among the more colorful characters of the European far right, none was nearly as charismatic as Jörg Haider, a one-time FPÖ leader, who died in a car crash in 2008 after (possibly) returning home from a gay bar. His successor, Heinz-Christian Strache, is nearly as colorful — he posed almost naked in the run-up to last September’s national elections. Strache (pictured above) led his party to a strong performance in those elections, narrowly trailing the center-left Sozialdemokratische Partei Österreichs (SPÖ, Social Democratic Party of Austria) and their junior coalition partners, the center-right Österreichische Volkspartei (ÖVP, Austrian People’s Party). Given the coziness of Austrian politics, where grand coalitions of the left and right are common, voters have few alternatives, though the FPÖ is one of them, and it could emerge as the winner of the highest number of votes in Austria’s European elections. 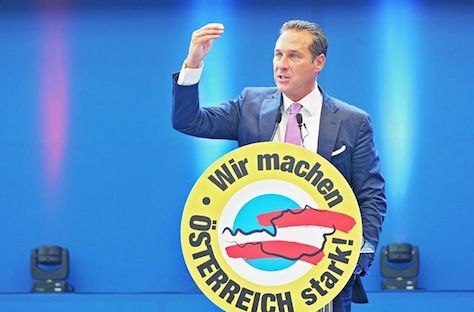 A newly formed liberal party, Das Neue Österreich (NEOs, The New Austria), which won its first seats in the Austrian Nationalrat last September, is set to improve on its performance in European elections. Latest poll (Electionista poll average): ÖVP 24%, SPÖ 24%, FPÖ 21%, NEOs 13%, Greens 13%. Golden Dawn represents not only the most virulent of the eurosceptic parties, but the most xenophobic, neo-Nazi instincts in all of Europe. 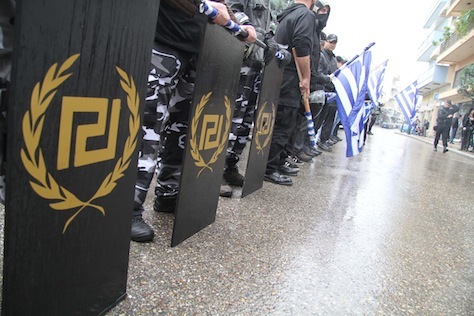 Greece’s government has engaged a relatively risky approach of cracking down on Golden Dawn and its leaders with criminal prosecutions — a strategy that could ultimately backfire by making Golden Dawn’s leaders martyrs among its supporters. In the first round of the local elections in Athens last weekend, Ilias Kasidiaris, the national spokesperson for Golden Dawn, finished fourth in the Athens mayoral race. With 16.12% of the vote, he finished just under 5% the leading candidate — too close for comfort for much of Greece’s political elite. There’s a strong chance that Golden Dawn could emerge as the third-largest Greek party after Sunday’s vote. Most Greeks see the European elections as a proxy battle between the leading party in the coalition government of prime minister Antonis Samaras, New Democracy (Νέα Δημοκρατία), and the opposition, anti-bailout SYRIZA (the Coalition of the Radical Left — Συνασπισμός Ριζοσπαστικής Αριστεράς). SYRIZA’s leader, the telegenic Alexis Tsipras, moreover, is the European Commission presidential candidate for the Party of the European Left. Though the leftists are very unlikely to win the European parliamentary elections, the nomination has given him a larger European profile throughout the campaign. The EP vote is widely seen as a proxy for Greece’s next national elections. Latest poll (Electionista poll average): SYRIZA 26.5%, ND 26%, To Potami 10.5%, Golden Dawn 8.5%, Communists 7%, PASOK 6%. The newest of the eurosceptic parties, the AfD is also among their tamest. Its leaders, mostly center-right economists and other technocrats, have loudly rejected the xenophobic politics of leaders like Wilders and Le Pen. Though it’s the first eurosceptic party in Germany, traditionally an engine of European integration, the AfD seeks to make the European Union stronger by pulling Germany out of the eurozone and returning to the Deutsche Mark (or a currency among the stronger northern European countries), on the basis that the eurozone has weakened European unity by impoverishing southern and other troubled members of the eurozone who need different monetary policies than northern Europe. In so doing, the party’s economists have floated some of the most sophisticated economic models for how countries might leave (or rejoin) the eurozone. In Germany’s federal elections last September, the AfD won 4.7% of the national vote, just shy of the threshold to win seats in the Bundestag, the lower house of the German parliament. 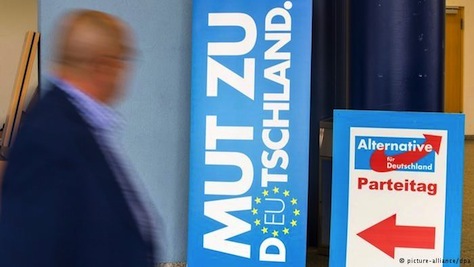 Though the AfD is set to win its first European parliamentary seats, the European elections are likely to hand German chancellor Angela Merkel and her center-right Christlich Demokratische Union Deutschlands (CDU, Christian Democratic Party) almost a massive a victory as it won in September 2013. Despite joining a grand coalition in December with the center-left Sozialdemokratische Partei Deutschlands (SPD, Social Democratic Party), and despite the fact the SPD’s Martin Schulz is the Commission presidential candidate of the center-left Party of European Socialists, which could win the largest sure of seats after Sunday’s voting, the CDU and its Bavarian sister party, the Christlich-Soziale Union in Bayern (the CSU, the Christian Social Union), are set for another double-digit win. Though the AfD are getting most of the attention as Germany’s first eurosceptic party, it’s worth noting that top officials within the CSU remain highly suspicious of the eurozone, and some even called for Greece’s eurozone exit in 2011 and 2012. Latest poll (Infratest dimap): CDU/CSU 37%, SPD 27%, Green 9%, Left 9%, AfD 7%, FDP 3%. 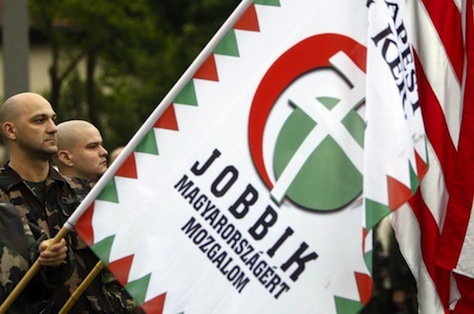 Jobbik, like Golden Dawn, is one of Europe’s most virulently xenophobic, nationalist, anti-Semitic and anti-Roma political parties. If Germany’s AfD lies on the tame end of the spectrum, Jobbik is one of the most controversial parties in the entire European Union. Its leader, Gábor Vona, calls Hungary’s EU accession in 2004 a ‘huge scam.’ Among Europe’s far-right parties, leaders make no secret of their support for Russian president Vladimir Putin in the ongoing political war against everyone from pro-Western Ukrainians to the LGBT movement, and Jobbik is one of the most pro-Russian parties in Europe. Nevertheless, Jobbik made historic gains in the national elections in April, winning 20.7% of the national vote, nearly as much as the country’s ill-fated coalition of centrists and center-left parties, headed by the listless Magyar Szocialista Párt (MSzP, Hungarian Socialist Party). Though Jobbik may overtake the Hungarian Socialists in the European elections, the clear winner will be the national conservative prime minister Viktor Orbán, who recently won a near-landslide victory for his party, Fidesz – Magyar Polgári Szövetség (Fidesz – Hungarian Civic Alliance). Though European leaders have been wary of Orbán’s constitutional agenda in the past four years, and there’s plenty of reason to be wary of another four years of Orbán rule, the popularity of Fidesz creates a ceiling for Jobbik’s support. Latest poll (Median): Fidesz 56%, Jobbk 17%, MSZP (Socialists) 14%. The Five Star Movement (M5S) burst onto the national political scene after Italy’s February 2013 elections, when it essentially drew a tie against the centrosinistra (center-left) coalition led by the Partido Democratico (PD, Democratic Party) and the centrodestra (center-right) coalition led by what is now Forza Italia, the predominant conservative Italian party, headed by former prime minister Silvio Berlusconi. Like many leftist parties, the M5S is less anti-Europe than it is anti-austerity, and its support comes largely from disaffected voters on the right and the left who believe that EU membership has largely impeded Italy’s employment and economic growth. 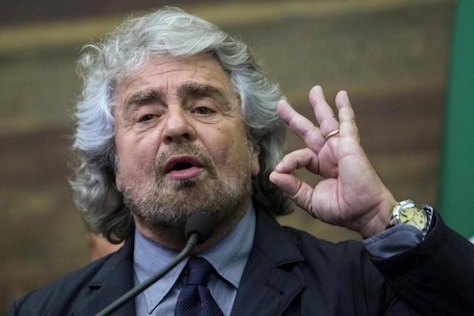 Though Grillo has called for a referendum on whether Italy should remain within the eurozone, his aim seems to be more about changing European policy to a more growth-oriented orientation. Berlusconi, however, is waging the center-right’s European campaign almost solely based on bashing Europe, and he’s blamed Brussels for a ‘plot’ to oust him from office in November 2011, when Berlusconi left office amid rapidly spiraling bond yields. Berlusconi, who is currently serving two years of community service after a tax fraud conviction, cannot stand as an MEP, but hes nonetheless leading a characteristically wily campaign. Meanwhile, the PD is hoping for a strong win. It’s only been three months since former Florence mayor Matteo Renzi essentially effected a parliamentary coup to oust his own party’s premier, Enrico Letta, to become Italy’s prime minister, with a laundry list of urgent economic and political reforms. Though the pace of some of those reforms has slowed in the campaigning for European elections, the 39-year-old Renzi desperately needs a strong showing in order to push ahead with his agenda. Latest poll: (Electionista poll average): PD 32.5%, M5S 25.5%, Forza Italia 19%, NCD 5.5%, Lega Nord 5%. 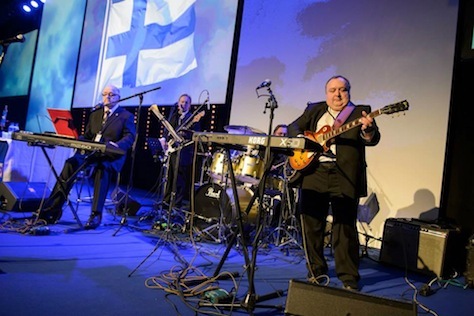 Formerly known as the ‘True Finns,’ the party won 19.1% support in the 2011 parliamentary elections, and it’s Finland’s chief opposition party. Though it’s ostensibly on the right wing, it’s more populist than ideological, and it’s support for the Finnish social welfare state is unwavering. Though the Finns Party opposes liberal migration, the party’s euroscepticism, which caused it to sharply oppose bailouts for Greece and Portugal, has the feel of the CSU or the AfD in Germany rather than the stronger xenophobia of other eurosceptic parties. With elections due to be held before April 2015, most of Finland’s political parties are watching the European elections as a dry run for national elections. They come as the country’s prime minister, Jyrki Katainen, who leads a six-party coalition, has pledged to step down in June. Fans of the Danish television show Borgen might recognize the Danish People’s Party as the old-fashioned, conservative ‘Freedom Party’ led, in the fictional series, by the curmudgeon pig farmer Svend Åge Saltum. Its real-life analog, however, is leading polls in the Danish campaign for the European parliament, and it’s taking a strong eurosceptic stand in so doing, on the predictable lines of greater national autonomy and more control over borders, though the campaign has become more well-known for the creepy Danish television ad attempting to convince citizens to vote in the elections. In addition, the Folkebevægelsen mod EU (the People’s Movement against the EU), a cross-party coalition that exists solely to oppose further EU encroachment on national policy, is set to win nearly 10% of the vote. In addition, Danes will vote in a referendum on Sunday to determine whether to join the EU’s new patent court. 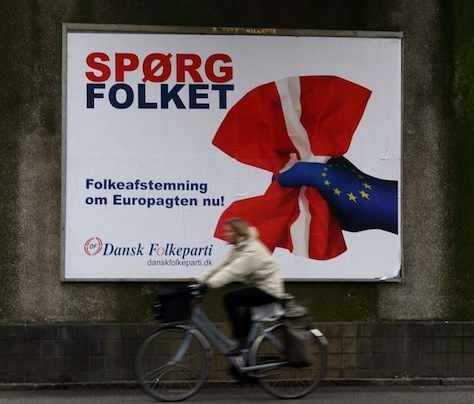 A strong turnout among eurosceptic supporters could jeopardize Danish membership. Helle Thorning-Schmidt, prime minister since 2011, could see her Socialdemokraterne (Social Democrats) fall to third place, and she’ll face a tough fight leading her largely left-leaning coalition into the next general elections, expected in summer or autumn 2015. Of all of Europe’s eurosceptic parties, the only one that polls show is set for huge losses is Vlaams Belang, the anti-immigrant, xenophobic party that advocates the independence of Flanders, together with strict immigration controls. On May 25, it’s triple-election day in Belgium. Belgian voters will not only elect their MEPs, but the national government in Belgium and regional parliaments in Flanders, Wallonia and the Brussels capital region. At each level, Vlaams Belang seems to have lost support to the more conventionally center-right, economically conservative Nieuw-Vlaamse Alliantie (N-VA, New Flemish Alliance) of Bart de Wever, another party in favor of Flemish independence, though the N-VA has soft-pedaled its independence platform in favor of gradually greater autonomy for the Flemish region and for tax and budget cuts, popular in the right-leaning Flemish region. 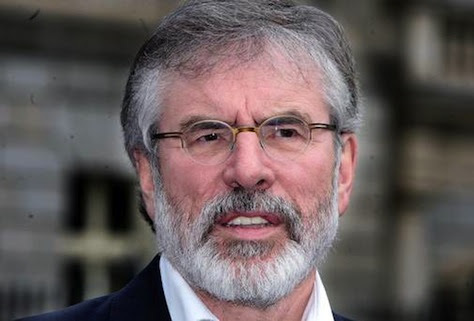 Earlier this month, when Sinn Féin leader Gerry Adams was arrested for his connection to a 1972 murder in Belfast, it reminded voters in both Northern Ireland and the Republic of Ireland why they were so wary of Adams and his potential role in the Irish Republican Army. But with Sinn Féin, waging a left-wing, soft eurosceptic campaign in the European elections, Adams’s arrest by Northern Irish authorities in the United Kingdom had major implications for the battle for Ireland’s 11 seats in the European parliament. Though Sinn Féin will compete for the three seats allocated to Northern Ireland, and it will almost certainly win one or two of them, it’s set to take, potentially, the largest share of the seats in the Republic of Ireland, where the governing centrist Fine Gael of taoiseach Edna Kenny; its junior coalition partner, the Labour Party; and the opposition center-right Fianna Fáil, still blamed by many Irish voters for the financial crisis, the nationalization of Irish banks, and the economic mismanagement leading to the crisis years, are all set to lose ground. 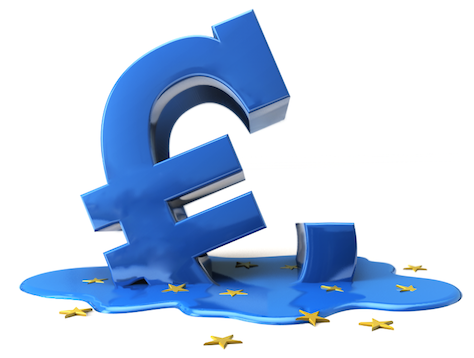 Like Grillo’s Five Star Movement in Italy, Sinn Féin’s opposition to Europe lies with the actions of the European Central Bank and other financial institutions. 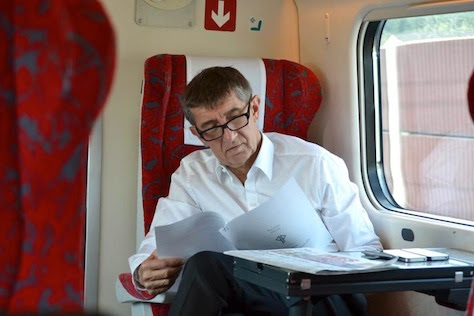 Babiš, a wealthy businessman and philanthropist, came out of nowhere to nearly win last year’s Czech parliamentary elections. In the coalition talks that followed, his anti-corruption, center-right ANO joined a government with the center-left Česká strana sociálně demokratická (ČSSD, Czech Social Democratic Party). Babiš became deputy prime minister and finance minister in the new government. Now, ANO is set to win the largest share of the Czech vote in the weekend’s European elections, and no one really knows where to place it on the scale of euroscepticism. It’s worth noting that Czech conservatives have long been wary of EU influence, and former Czech president Václav Klaus was one of the chief critics of greater EU economic and political union. Though the Občanská demokratická strana (ODS, Civic Democratic Party), which lost power in the last national elections, is running on a campaign to prevent the Czech Republic from entering the eurozone, and Tradice Odpovědnost Prosperita 09 or ‘TOP 09′ (Tradition Responsibility Prosperity 09), its former coalition partner, led by the aristocratic, former foreign minister Karel Schwarzenberg, is running on a pro-European campaign that jokingly suggests, ‘Don’t bother with Europe,’ ANO’s ultimate position on Europe might still emerge somewhere in the middle. There’s even talk that ANO will join the third-largest European-level party, the Alliance of Liberals and Democrats for Europe party (ALDE). That would position the ANO as much less eurosceptic than Klaus and the ODS. Latest poll (TNS AISA): ANO 28.5%, ČSSD, 18.5%. Farage photo credit to Deadline News. 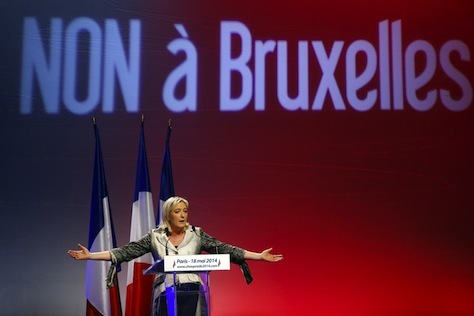 Le Pen photo credit to Francois Mori / AP. AfD photo credit to dpa. Previous PostIn Depth: EU VotesNext PostCan Poroshenko deliver his fairy-tale promises to Ukraine? The part about the Czech Action of Dissatisfied Citizens (ANO 2011) is completely wrong. It’s written by somebody who des not know anything at all about Czech poitics. Babiš is highly critical of Klaus and his euroscepticism (and mr. Klaus is higly critical of Babiš). ANO is very much a pro EU party, it’s ballot is even led by a former european commissioner, Pavel Telička. It’s true that ANO isn’t incredibly like many of the other hard eurosceptic parties, but Babiš and other ANO officials have sent mixed signals about Europe, especially about further Czech integration, such as eurozone accession — Babiš has softened his stand on the euro, but remains incredibly wary. I was using it here as an example of the soft anti-Brussels eurosceptism that most major Czech parties have deployed throughout the campaign. The idea isn’t that ANO is like Úsvit or Svobodní. I could have used ODS as well.